Garden writers Bob Lilly, Susan Carter, and Carrie Becker share their extensive knowledge of plants and gardens with timely articles and answers to your questions. Submit your gardening questions to experts@hardyplantsocietywa.org! Join us for a fabulous evening and reignite your passion for the worlds most beloved flower. 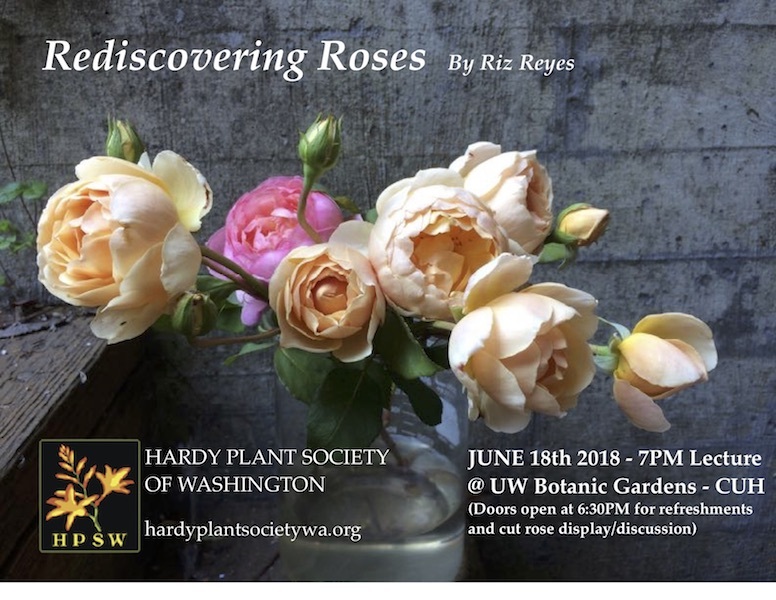 Riz will discuss the basics of growing roses in the Pacific Northwest and which types to really seek out for your garden and vase. Feel free to bring roses from your garden to share and discuss. Following the lecture, we’ll take a short walk out to the UW Farm to see their roses and other cut flowers in bloom and for those interested in learning more, Riz is offering a very special workshop creating unique bouquets using fragrant fresh roses from the farm and other local/seasonal flowers/foliage that participants will get to take home! I live in Hunters, WA, overlooking Lake Roosevelt. My garden and front rockery get full sun year round, unfortunately accompanied by winds gusting up to 50mph. The past few winters, our temperature has only dropped to near zero in the winter, but is known to drop as low as -20 degrees. On the plus, we are surrounded by over a thousand acres of cow pasture- excellent manure! I have attached a photo of my garden area. 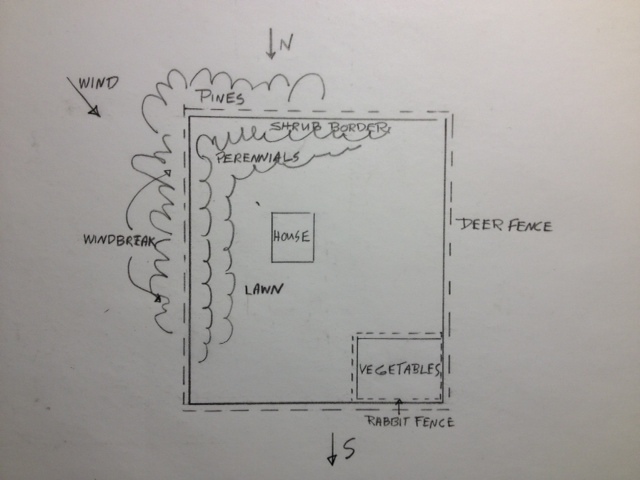 We looked at your ultimate goal of having larger gardens, and eventually transforming it into an English Garden. The first, and maybe most important challenge would be to have a good strong windbreak and protection against deer and elk. You may not have had any visitors from the woods and pastures yet, but as soon as they find that you’re providing some of their favorite snacks they’ll be your constant companions. We’re not certain what direction your property is facing, but let’s assume that the house and outbuildings are facing north and south, and that the wind is primarily coming in from the northwest. The site plan we’ve given you can be changed depending on these factors. The suggestions are based on a site plan that includes your house, other buildings and the proposed gardens. A deciduous border inside the windbreak will provide further protection plus seasonal interest. Plants might include wild roses, lilacs, Cornus stolonifera (red-trigged dogwood), Symphoricarpos albus (snowberry), and Philadelphus coronarius (mock orange). The perennial border would go in front of this. Here you could include asters, helianthus, helenium, phlox, peonies, and grasses. Experimenting with perennials has always been our focus, both professionally and personally, so have fun with this. 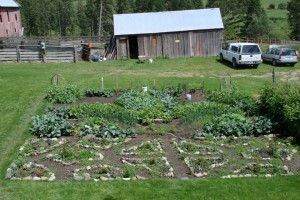 You might want to research the practice of crop rotation for your vegetables. This is the practice of growing different crops in different places each year to control disease and replenish soil nutrients. Seattle Tilth has some good information on this. seattletilth.org/learn/resources-1/…/crop–rotation-for-plant-health. Hope these ideas help. Please let us know if you have any further questions. 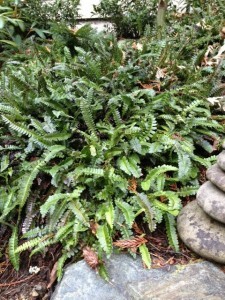 This small-scale hardy fern is very adaptable in the Pacific Northwest and makes a great year-round groundcover. Blechnum penna-marina, is happy in light shade but will grow in deeper shade as well as full sun if the soil is kept moist. The new foliage emerges bronzy-red, aging to deep green. The tightly packed fronds slowly spread by creeping rhizomes to form a very effective groundcover. Its variety B. ‘Cristatum’ is similar and its tips are curiously crested. In both forms the fertile fronds are reddish brown, thin and upright. PREFERRED GROWING CONDITIONS: Moist, shady woodland spot in well-drained, acidic, humus-rich soil. Shade to part shade is perfect but will take full sun in the Pacific NW if kept moist. MANAGEMENT: Groom in late winter or early spring. Remove old fronds as necessary. 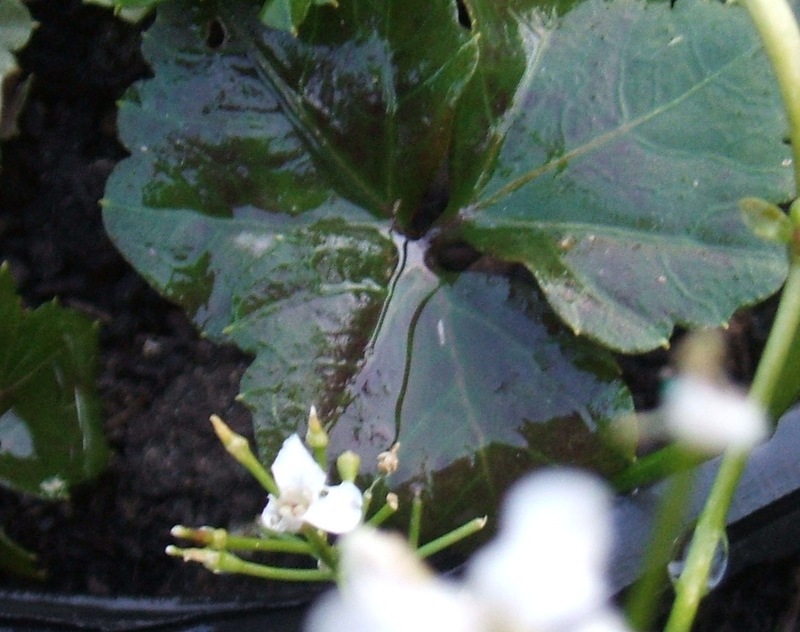 Cut well established plants to ground in late winter to fully appreciate the new foliage; recommended only on older clumps that have become ratty or are badly damaged by winter wet or snow cover. COMPANIONS & USES: Heuchera, ajuga, dwarf polygonatum. Amongst rocks, in rockeries, niches, and walls. IDEAL SPACING AT PLANTING TIME FOR FULL COVERAGE IN 2-3 YEARS: 8” on center or less. It can be a bit slow to spread in the beginning. B. penna-marina, Little Hard Fern, is an evergreen fern with a Royal Horticulture Society Award of Merit. It’s height and spread in one year are 4” x 5” and in five years will reach 4-6” x 24”+. The foliage is dark green, small, leathery and glossy. Zone 5-8. B. penna-marina ‘Cristatum’ is a bit smaller than the species. Did that get your attention? It certainly does for the bees that pollinate Weigela middendorffiana. They have learned to visit yellow flowers preferentially, as they contain the most nectar. As the flowers age, they turn red, and one study noticed that bees visit the older, less nutritious flowers less frequently. Floral color change after fertilization is not uncommon (Asters, Orchids, Fuchsias), but the color change is probably dependent on age, not bee-behavior, because the pollen tubes require several days to reach the ovaries. If the flower dropped off right after pollination, the plant wouldn’t be able to reproduce! Thanks again go to Dan Hinkley and the Miller Garden for introducing me to this unusual shrub. 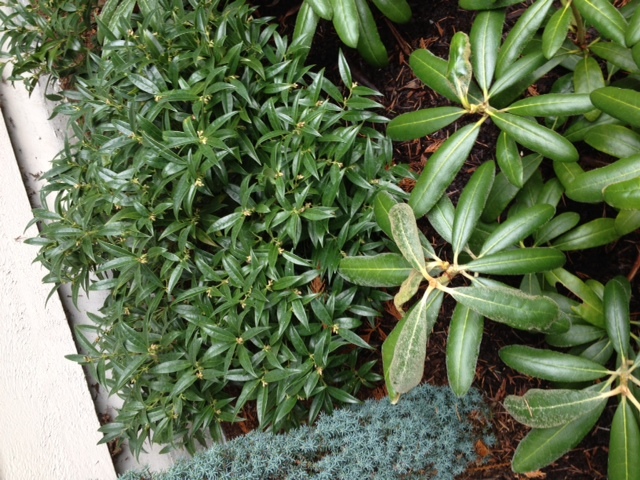 I live in Gig Harbor, WA (cold zone 7) and would like to plant a “spiny” leaved holly that can grow to at least 10′ in height & width as a yard parameter hedge. The soil is acidic and has full shade from the towering Douglas Firs on the property. I found the below info about Blue Holly. Can you let me know if this will work before I invest the time and monies please. Any specific species recommendations that do well in the wet Pacific Northwest? Ilex x meserveae ‘Blue Princess’ actually prefers full sun to partly sunny conditions. Although it may reach a height of ten-feet, it does so at a slow pace and probably wouldn’t fit your needs. 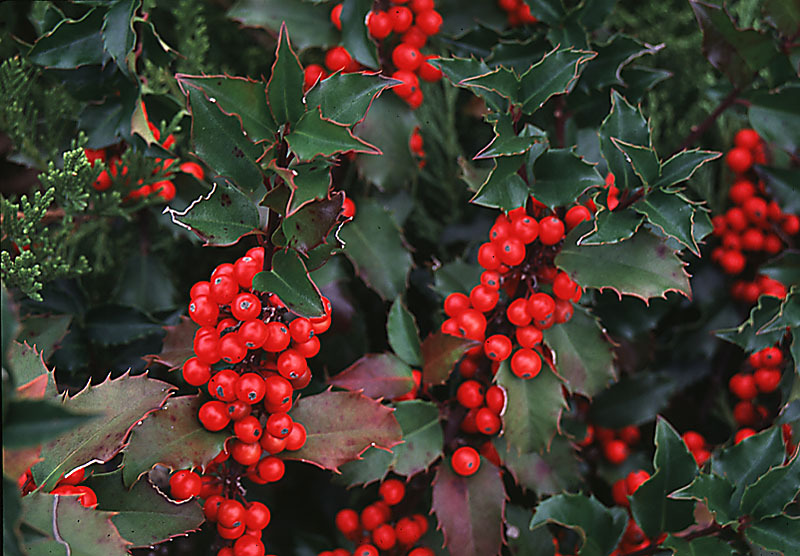 We’d recommend the standard English holly, Ilex aquifolium, as a plant that could work for you. 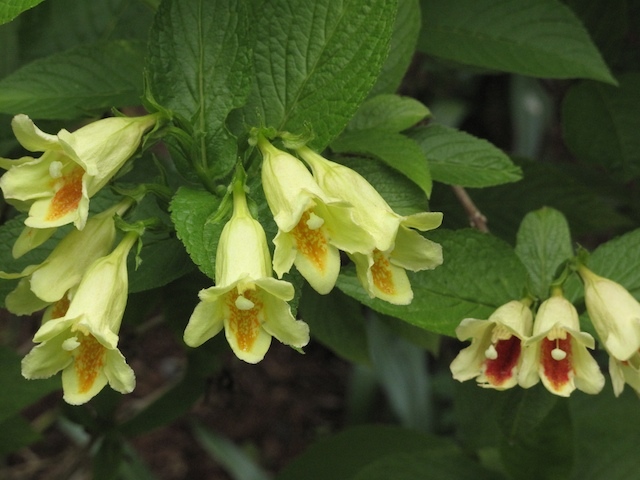 It does well in shade, grows fast, and can be pruned into a hedge shape if you desire. English holly has both male and female plants and bee pollinated, so you’ll want one male holly for each hedge. As with any new plants holly would require appropriate watering for the first several years to get it well established. We have a client who’s property is situated on the 16th floor with a rooftop garden in downtown Seattle. The terraced garden faces south and southeast. The 4 trumpet vines are each in their own containers that are 24″ square x 26″ deep along with Algerian Ivy, trailing Rosemary. They get full sun and some wind, but are up against a wall. The foliage growth appears normal and they’re working their way up the metal trellis support. 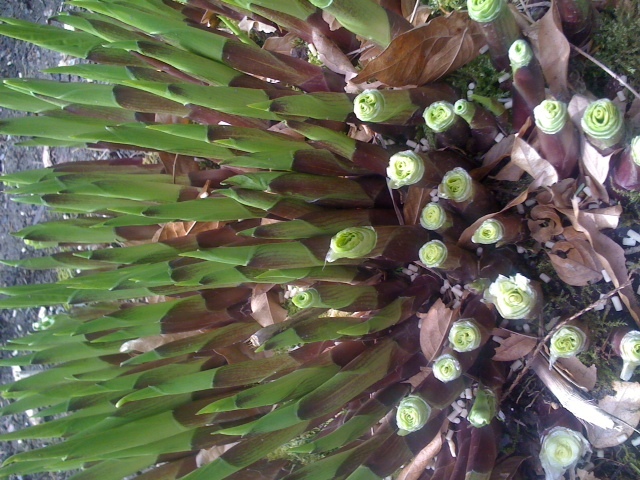 They have not bloomed yet, nor do they seem to be developing any buds. They bloomed last year (their 1st year in that spot) just coming out of a #5 nursery pot. So I can’t imagine that it’s because they’re growing in containers now. The pruning I did this spring was very light so I can’t see how that may be to blame. I also fertilized them in spring with an organic 9-3-4 all purpose fertilizer. I can’t figure out why they haven’t bloomed and hope you can. Thank you for your question on trumpet vines, (Capsis radicans). An American native, this vine really likes warm weather and with the exception of several days we really didn’t even have summer this year. Also, some say it takes several years for the trumpet vine to flower but since it flowered last year this is probably not the problem. This size of your container sounds fine, and your pruning technique was probably okay. The trumpet vine blooms on new wood, but it’s best not to cut it back too severely in the winter. We’d recommend fertilizing your container plants more often, at least every two weeks if not weekly. Miracle Grow would be an easy product to use. Let us know how this works (next year). I would like to plant some beesia at the top of a shady ravine. I am concerned about the moisture level, though. The area is dry shade, although I could run a line from my drip system along there. Even though I’ve read that beesia prefers moist soil, can it do OK with drier conditions? In this area I am trying to replace very established ivy. If the beesia won’t work, what would you suggest? Thanks so much! We love beesia! Unfortunately, it wouldn’t be happy with the site you’ve described. 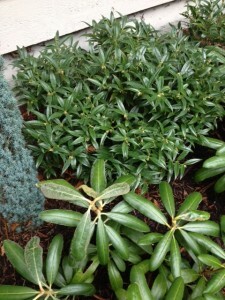 Beesia is an excellent ground cover for shady to part-shady, and consistently moist conditions. I’m also curious if you’re able to remove all of the ivy. I would put this at the top of the list, as ivy will pop back up if you haven’t gotten rid of every bit of it, and overwhelm almost any ground cover. Privot honeysuckle, Lonicera pileata, is an evergreen boxwood-like foliage with a slow spreading habit, and makes a good bank-covering ground cover in part shade. The woodrush, Luzula sylvayica is used as an ornamental ground cover for shady areas. It is best when planted in drifts. Euphorbia amygdaloides var. robbiae also does well in dry shade, after it’s established. It sounds like a site that would be appropriate for native plants such as Oregon grape, Mahonia repens, combined with sword ferns, Polystichum munitum. The sedge, Carex ‘Ice Dance’ makes a nice ground cover in the shade garden, although will look it’s best if kept from average to moist conditions. 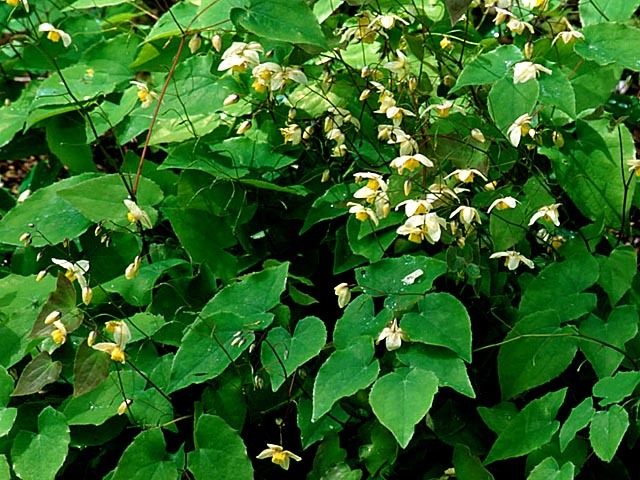 Evergreen epimediums are great woodland plants and are perfect for dry, shady spots. Epimedium ‘Enchantress’, E. x versicolor ‘Neosulphureum’ and ‘Sulphureum’ are among a few of the evergreen ones. The plant you’re inquiring about is Cardamine trifolia, commonly know as lady’s smock or 3-leaved cuckooflower. This is an attractive, well-behaved evergreen ground cover, about six-inches tall and covering up to twenty-four inches across. The dark green leaves with a purple reverse are three-parted. The white flowers are borne in early spring. Flowering is brief and they rarely set seed. Cardamine trifolia prefers shade to part shade, but will tolerate sun if kept moist, and likes humus-rich soil. It’s a good companion plant for many plants in the spring and shade garden and especially looks good under Lace Leaf Japanese maples as there are few plants that like these conditions. 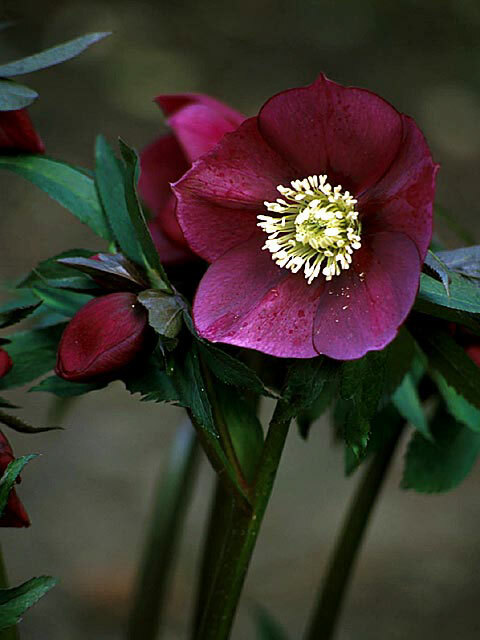 What’s the deal with hellebores? 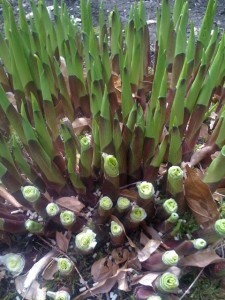 Should the leaves be removed from all hellebores? Remove the leaves of H. orientalis to the ground in January and February, being careful not to damage the stems of the emerging flowers. This is done to prevent disease from spreading and so you can see the flowers better. We usually leave the plant alone for the first two years. H. niger is a true evergreen, so only remove the leaves that look bad. H. argutifolius and H. foetidus have biennial stems that produce flowers in their second year. After they flower these stems can be cut to the ground and new shoots will have already emerged. Note: When you cut the stems back don’t leave stubs, cut them to the ground.